From torrential downpours to extreme summer heat and light, roofs must withstand a lot of abuse. Fortunately, most roofs are built to handle it. However, no roof can last forever, and there comes a time when all of the wear and tear begins to show. When this happens, this doesn’t always mean that you need a total roof replacement. 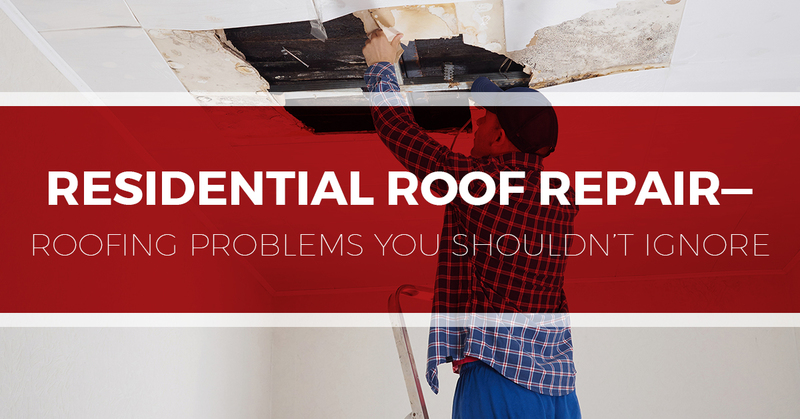 The issue can sometimes be resolved with a simple roof repair. The key to minimizing the work required is staying on top of roof inspections and identifying problems before they become savings-draining problems. In today’s blog, we at Tim Leeper Roofing would like to talk about some common roofing problems that you should not ignore. If you are in the Nashville area and are in need of a commercial or residential roofing repair, contact us! We can handle virtually all of your roofing needs. This includes roof inspections, roof installations, roof replacements, assistance with claims, and much more! Learn more about our services and get your free, no-hassle quote today! Missing Shingles—If you spot missing shingles or tiles, it is important to contact a roofing contractor. This is especially true if you are missing shingles on a large area of the roof. Roof Flashing—The function of flashing is to prevent water from seeping into joints in the roof and causing damage. If the flashing on your roof is missing or weakened, you are putting your roof at risk for some serious (and costly) water damage. Loose Materials—Similar to flashing, the materials around areas like chimneys, pipes, vents, and other openings can be easy places for leaks to form. If you notice any material missing or loose around any of your roof features, contact your local roofers. Granules—In addition to giving shingles some weight, granules protect shingles from the sun’s ultraviolet rays. Contact your local roofing repair company if you spot an excessive amount of granules in your gutter or on the ground around your home. Stains, Mold, and Algae—Though it’s ideal to catch leaks before they begin to stain and mold the interior of your home. Stains and mold on your roof are a little different. If you spot this problem, it likely doesn’t indicate a major roofing issue. Rather, it is something that can be easily wiped off. Pooling Water—Is there a puddle of water on your roof? If so, this is a telltale sign that there is something wrong, something that needs to be addressed ASAP. Any Leaks—For many homeowners, roofing problems become evident only after they begin to notice leaks. Ideally, you want to catch the problem before it begins to cause a leak. However, if you do notice a leak, it needs to be patched immediately. Don’t simply address the problem by wiping off the mold and placing a bucket under the leak. This dilly-dallying will only lead to more damage, i.e. more money spent on repairs. If you spot or suspect that your roof may have one of these problems, contact your trusted roof repair company. If you are in the Nashville area and are looking for professional roofing contractors who have earned a reputation for being able to perform a superior residential roof repair, contact Tim Leeper Roofing!